Email Marketing: What Do You Want to Learn? If you haven’t heard, I’m teaching a class on email marketing in New York City in January. While there is not set date and location yet, I’ll be working over the course of the next week to nail it down and open it up for anyone to sign up. But first, in creating a lesson plan, I found that there were a couple of paths I could take. To teach everything about email marketing would take far too much time, and would be far too confusing. But rather than pick apart the most important items myself, I thought that I would first open it up to you, the readers! Select from the options in the poll below or leave additional topics that you’re interested in the comments to this post. Thanks for your feedback! 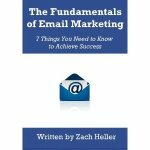 What topics are you interested in learning about Email Marketing?